Here's something from Mercedes-Benz for Lewis Hamilton fans. It's the Mercedes-Benz #GoodLuckLewis competition. 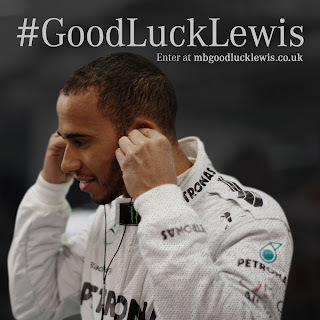 Mercedes-Benz is creating a virtual Silverstone racetrack asking Lewis's fans on Twitter to tweet #GoodLuckLewis messages for the British Grand Prix in order to power his F1 car around the track, to help him qualify for Sunday’s race. And everyone who tweets a good luck message to Lewis using the specified hashtag will have the chance to win some exciting F1 prizes, including: signed steering wheels, signed race suit, signed gloves and boots and a signed replica helmet. Sounds pretty good to me! ﻿UPDATE 26/06/13: The competition is now live, and you can enter and get more details at: mbgoodlucklewis.co.uk - note it's a slightly different link to what was on the site before. Thanks David. The page mentioned in the picture doesn't work for me either. I've just emailed them to ask when the page will be live and I'll let you know when I have an answer. Hello again. They've just got back to me, the website should be live by tomorrow morning at the very latest. Apparently the competition doesn't open until tomorrow (Tuesday), which was something I didn't realsie, so apologies for that. I'll update the post.